Aloha Animal Hospital was founded in 2000. The building was originally built in 1968 by founder and mixed practitioner, Dr. Bogart. The original name was East Vista Pet Clinic. Dr. Goodwin joined Dr. Bogart and then took the reigns as owner in 1972. The practice persevered through many years of dedication until Dr. Goodwin retired in 1999. Dr. Abella bought the business with the vision of bringing the quality of emergency veterinary care and specialty centers to a general practice facility. With a philosophy of spreading the aloha spirit, the name was changed to Aloha Animal Hospital. Numerous changes to the facility and equipment ensued and Dr. Zelles joined in the endeavour in 2002 bringing vast experience and ultrasound as a standard of our provided care. As the practice flourished, the working plant needed improving. Years of preparation went into the facility one sees today. Limited to the original footprint, Aloha Animal Hospital has evolved into a three doctor, full service facility that provides over 10,000 animals the best a general practice has to offer. We take enormous pride in our work and facility and hope to continue superior care for your pets. See a quick time version of our build out. We would especially like to thank Tom Sears for all his diligent attention to detail as the contractor and friend to Aloha Animal Hospital. 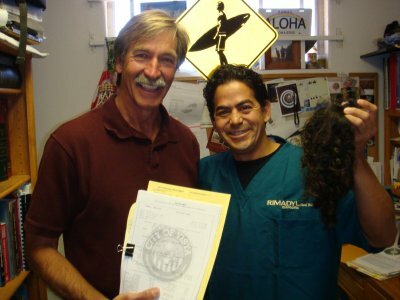 There was a bet in 2005 to have Dr. Abella grow his hair until a permit was approved. 3 years later, Tom and Dr. A proved it could be done (pictured above). The renovation could not be done without the help of many trade specialists including Paul White our electrician, Steve Heitchew (the Lone Rooter) our plumber, James Stickney the computer network master (Bushido Technical Solutions), Lomax for the HVAC system, Paul the cabinet maker, Juan the multitalented, Coby Hart for the parking lot beautification and asphalt expertise, Terry Craft the waterfall specialist, Jeff Williams the iron fence master, and Dave the commercial painter. A special thanks goes out to Steve Barton, the artist and friend who captures the essence of our style in a mural in our reception area and in many of his colorful paintings well-known with the wavy frames. Check out his studio at bartonstudios.com.